Are you familiar with the term “embodied cognition”? Embodied cognition refers to the mind-body connection. It is essentially the idea that children learn by interacting with their environment and through sensorimotor activities. It is more of a specific term than “multi-sensory” approach to learning which is what we typically use as therapists. Here is a great FREE printable to get kids learning the letter A through a multi-sensory, embodied cognition approach. 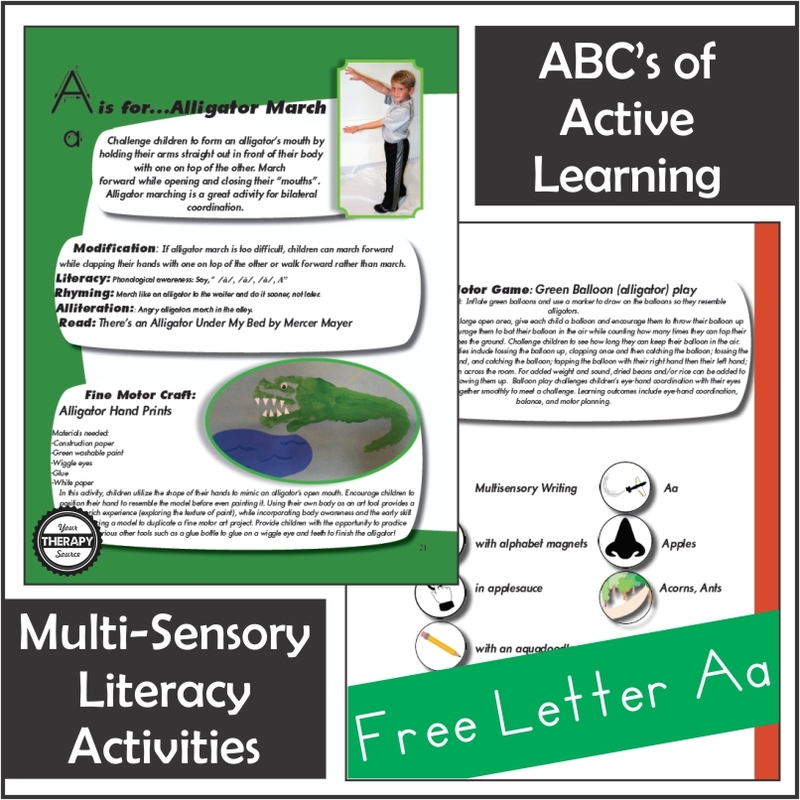 These two pages describe various activities to allow children to learn about the letter A through literacy, fine motor, gross motor and sensory input. Instead of just having children listen about the letter A, try having children follow these activities to listen, look, touch, smell and move in different ways to learn the concepts. 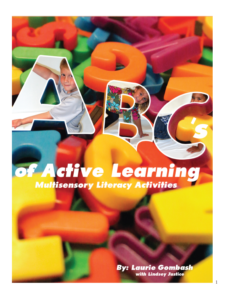 These sample pages are from the ABC’s of Active Learning ©. This digital download offers readers tons of multisensory literacy activities based on each alphabet letter. This book, based on years of experience as school-based therapists, is written by Laurie Gombash, PT with a Master’s degree in Education and Lindsey Justice, OT. Explore educational concepts through movement and multiple senses to give children opportunities to learn in ways they understand. The alphabet activities from A to Z are a collection of activities that can be used with children of all abilities. All activities are designed to be fun and motivating, while simultaneously providing rich multisensory input, improving motor development and learning. FIND OUT MORE. Need more ideas? Check out the ABC’s of Movement® digital download of 26 educational flash cards that combine movement with literacy development.